The Landward Defence component of the South African National Defence Force (SANDF) will make do with only a slight increase in funding over the next three years, with R16-17 billion allocated to Landward Defence annually. For the 2018/19 financial year, Landward Defence was allocated R16.2 billion. This increases to R16.4 billion in 2019/20; R17.4 billion in 2020/21 and R17.0 billion in 2021/22, according to the latest Estimates of National Expenditure released earlier this month. Landward Defence spending makes up a third of the total defence budget (R50 billion). 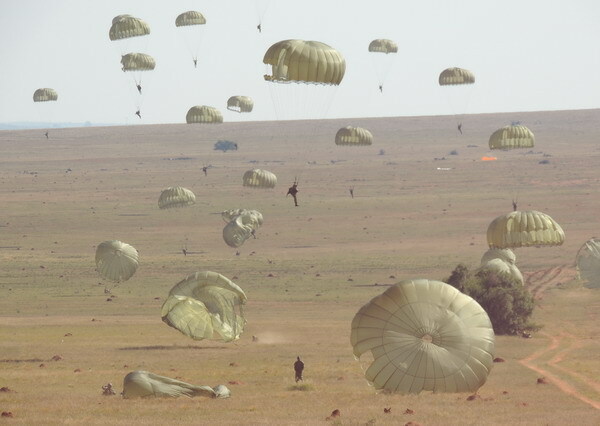 Most of the Landward Defence budget goes towards the Infantry Capability (R6.6 billion in 2018/19) followed by Support (R4.5 billion), Signal Capability (R1.3 billion), Engineering Capability (R795 million) and Air Defence Artillery Capability (R547 million). The Armour Capability, which is due to receive over 200 Badger infantry combat vehicles, was allocated R472 million in 2018/19 and this will increase to R497 million the following year. Focus areas over the next three years include arresting the decline in critical defence capabilities, participating in peace support operations, safeguarding South Africa’s borders and territorial integrity, supporting the people of South Africa through collaboration with other departments, and refurbishing and maintaining infrastructure. As part of its efforts to ensure peace and stability in Africa, the department expects to continue participating in peace support operations in the Democratic Republic of the Congo under the auspices of the United Nations stabilisation mission (Monusco). To this end, the department intends to deploy an infantry battalion supported by Rooivalk and Oryx helicopters. The department also expects to continue its deployment of 4 military observers as part of the African Union mission in Sudan’s Darfur region. R3.2 billion over the medium term is allocated in the Force Employment programme for activities related to peace support operations. Border security remains a key priority for the South African National Defence Force, especially the country’s land and sea borders. Accordingly, over the three-year Medium Term Expenditure Framework (MTEF) period, the department plans to deploy 15 landward subunits to patrol 4 471km of South Africa’s land borders with Zimbabwe, eSwatini (Swaziland), Mozambique, Lesotho, Botswana and Namibia. R3.7 billion is allocated over this period for land border control. The South African Navy is tasked with protecting South Africa’s maritime borders and this includes ongoing maritime border patrols along the Mozambican channel to combat piracy. Over the medium term, R1.6 billion is allocated, mainly in the Maritime Defence programme, for the implementation of the maritime security strategy along the east coast of Africa. One of the Department of Defence’s priorities is to arrest the decline in critical defence capabilities as outlined in the 2015 Defence Review. Over the next three years the department said it will focus on implementing parts of the review that are related to arresting the decline in critical defence capabilities. “Due to the constrained fiscal outlook, the department expects to only partially implement critical elements of the review such as improved operational support systems and urgent equipment enhancements,” it said.